This week CNN interviewed Al Samani Al Hadi, the half brother of Sudanese Christian Dr. Meriam Yahya Ibrahim. He is enraged that his sister will not return to Islam and the jihadist bosom of the family that she never knew she had. For this, she deserves to die, says Al Hadi in a story posted in The Daily Mail on June 5. 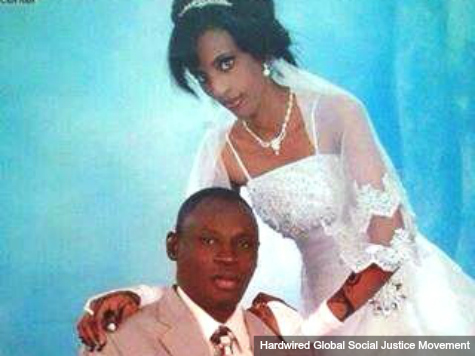 Al Hadi, the offspring of Meriam’s absent Muslim father after he abandoned Meriam and her Ethiopian Orthodox mother, is the brother who reported Meriam and her South Sudanese Christian husband, Daniel Wani, to the authorities, accusing her of adultery for a marriage not recognized under Sharia. Apart from all those pesky issues that have been ignored by both the Sharia court and the self-righteous Al Hadi, such as the right to religious freedom under God and under Article 18 of the International Covenant on Civil and Political Rights, which, by the way, has been ratified by Sudan, there are several other rats to smell in the Muslim brother’s story in The Daily Mail. The title of the article expresses Al Hadi’s belief that Meriam abandoned “her Islamic faith” by marrying a Christian. Wrong on two counts. First, Meriam never had an Islamic faith to abandon. Meriam was not only brought up in the Christian faith, she embraced for herself the God of the Christian faith. That is evident by her courage in the face of persecution and death. Her husband Daniel marveled at her peace and fearlessness upon hearing of her death and flogging sentences. He was in tears but said of Meriam, “She is very strong.” Second, it was not Meriam’s marriage to Daniel that made her a Christian, and she was not, as some news stories erroneously have stated, sentenced to death “for loving a Christian.” She was sentenced to death for loving Jesus Christ. Al Hadi demands that Meriam return to Islam because “his family are Muslim people.” His family is not Meriam’s family, however. And though, of course, Meriam would have the right not to be Muslim even if Al Hadi’s family were her family, the dichotomy is even more justified because the man who spawned Al Hadi abandoned a family that included Meriam when she was six years old. Finally, the biggest rats in Al Hadi’s story are his motives for reporting Meriam. First of all, as an Arab-identifying, Muslim Sudanese, Meriam’s half-brother is probably dismissive and contemptuous of black, African South Sudanese. He would feel both angry and dishonored that a woman from his family would be married to a South Sudanese. Second, somehow this long-lost brother found that Meriam is a successful businesswoman. Reports have varied on the extent of her property, but most sources say that she owns a small farm and a shop, in addition to being a doctor. Al Hadi and his Islamic family, rather than waiting to embrace sister Meriam, are hoping that she will not give in and renounce her Christian faith. They are counting on her execution so that they can grab all her assets, business, and even her children, 20 month-old Martin and newborn Maya. Some media sources have also reported that Al Hadi and other family members have declared their intentions to kill Meriam herself if she is released from prison. Is Al Samani Al Hadi a devout Muslim trying to preserve the Islamic faith of his family, or is he a self-righteous hypocrite, using and reveling in the violence and supremacism of Sharia to put an infidel in her place and achieve wealth without working for it? Both. But more critical, he is a threat to Meriam. That threat dictates that those who are concerned about her must make robust efforts not only to secure her release from prison, but her immediate ability to leave Sudan and come to America.